Keep in mind that this is only a guideline for the actual procedure. This is where you should check a service manual to be sure you’re not screwing anything up. (Honestly, my Land Rover is the only vehicle I’ve had that is very specific about the operations procedure, but you never know) Failure to follow the factory instructions can result in the oil pump losing its prime and, thus, its capacity to pump oil. 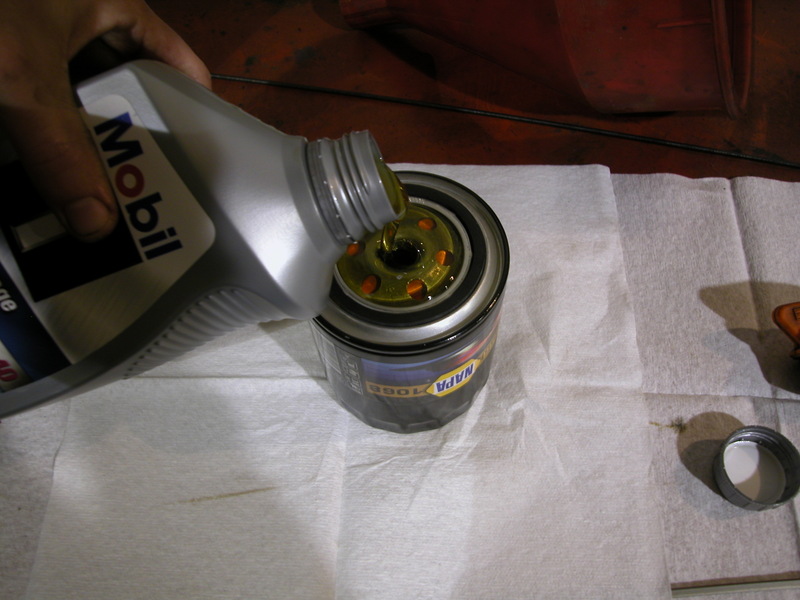 Remember: oil serves as a much better lubricant than air does. The same principle applies if you forget to purchase all your oil and filter prior to getting started. It is tough to drive to the store with no oil in the engine*so be sure you have ENOUGH OIL and the PROPER FILTER and the PROPER TOOLS before you proceed. Got it? Good! The purpose of changing the oil is to get all the worn out oil and dirt out of the engine and replace it with clean, fresh lubricant. 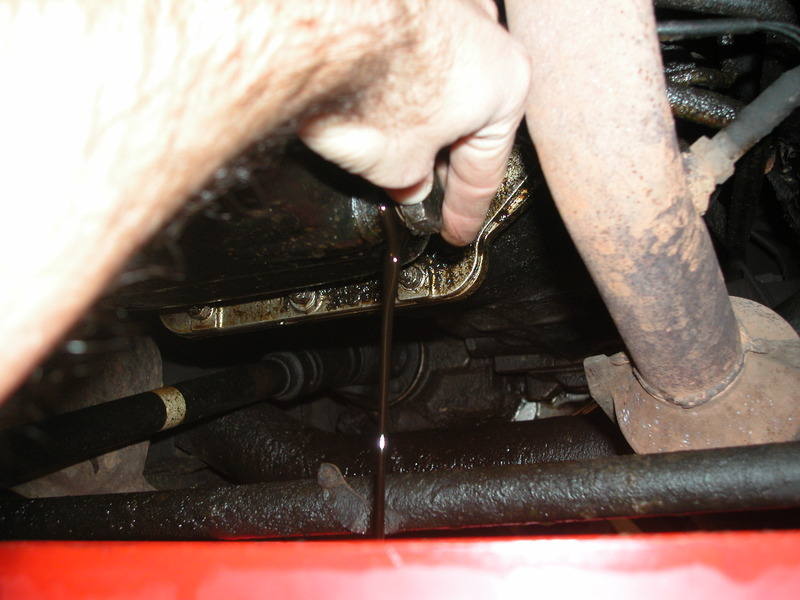 Draining cold oil isn’t recommended, as you will be leaving all kinds of dirt inside the engine. 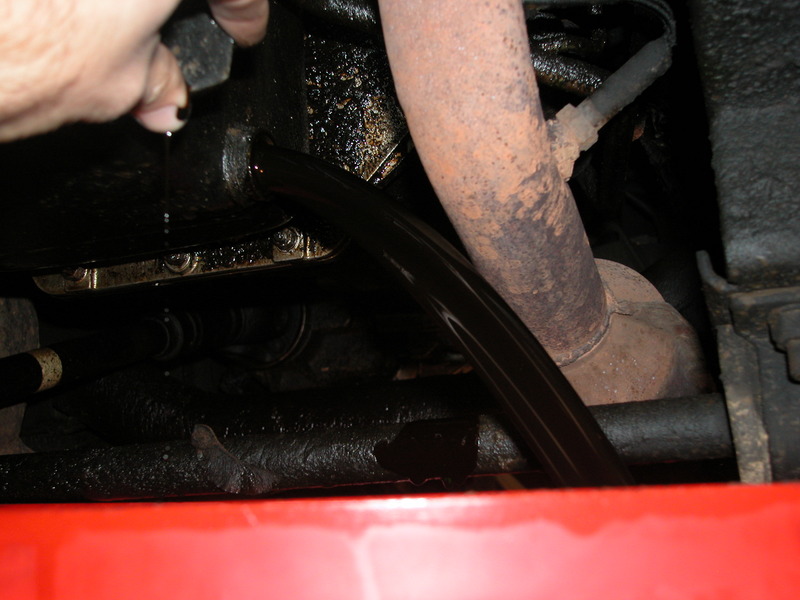 By driving your car a few miles before draining the oil, you’re stirring up all the sediment into suspension so it will flow out of the sump with the old oil. Plus, as an added benefit, hot oil running down your arm will warm your extremities if you are forced to service your car in sub-freezing temps. 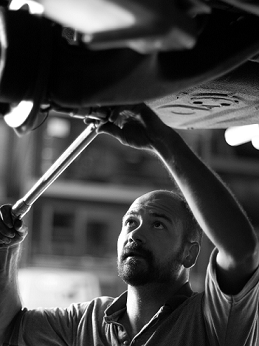 Get your vehicle up off the ground so you can reach the bits that need fiddling. I'm only using a lift for photographic purposes only--not for my own benefit. I would never do that. Once the car is up on the ramps or jackstands, put it in gear (or “Park”, if an automatic transmission–but why on Earth would you ever own one of those? ), set the parking brake, and CHOCK THE REAR WHEELS with a block of wood or actual wheel chock. The only thing worse than having your car fall off the ramps when driving up them is to have it fall on top of you while you’re underneath (although there tends to be less cursing involved with the latter outcome, due largely to terminal injuries). Everything look safe? Does the car move at all if you push against it? If you’re willing to bet your life on the safety of the setup, then proceed. If not, DON’T go any further until you get it absolutely secure. I will often try to loosen the plug with a wrench for the first couple of turns but will then switch over to using my fingers for the remainder of the threads because they are faster and easier to clean up than what a wrench would be. 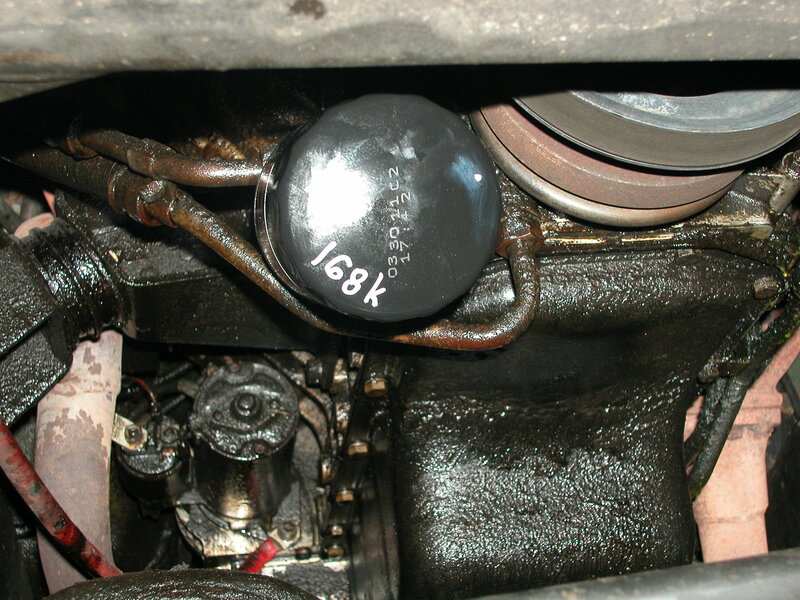 Oil will begin to drip from the plug threads before the plug is completely out. This is good, because you know you’re doing something right, but bad, since the plug (and your fingers) will now be coated with oil. 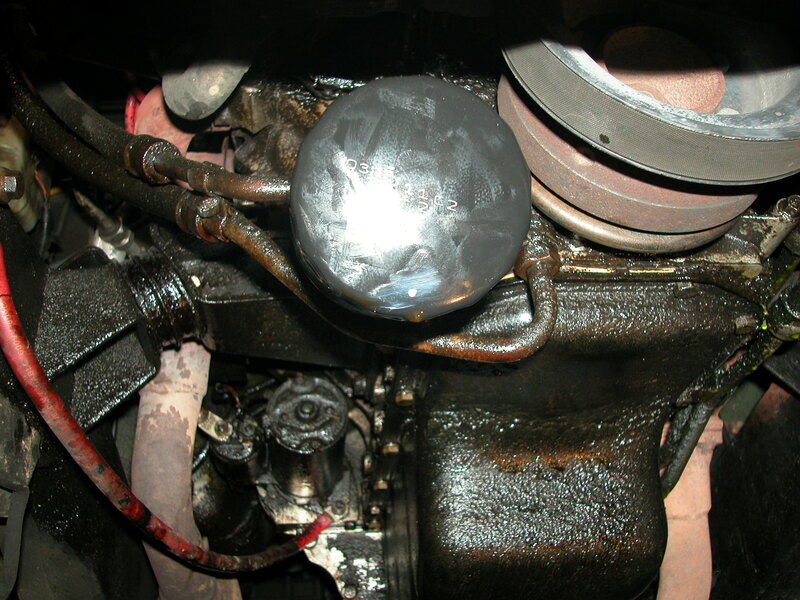 Keep turning it with your fingertips until the plug is free and the hot, dirty oil gushes out of the engine sump and down your arm, whereupon you will drop the drain plug and washer into the half-full catch basin at the shock of just how hot & fast the oil is pouring down your arm. The plug will splash oil over everything within a 3-foot radius. Now is a good time to commence cursing at moderate volume. Once your forearms are clean and you’re ready to re-install the drain plug, you will have to fish it out of the murky pool of oil in and around the now-full catch basin. While you are elbow-deep in the hot black mess, you should probably find the washer that fell off of the drain plug when you dropped it in such haste. Now clean your forearms again before proceeding. After the plug has been rescued and thoroughly cleaned, install a new crush washer and gently thread it back into the engine, starting with your fingers first. DO NOT CROSS-THREAD IT, as this will get ugly and costly to repair. (if you’re unsure how to install an object without cross-threading and forcing it, I suggest you practice on lightbulbs. If successful, you will be rewarded with a warm glow. If unsuccessful, you will be rewarded with a warm trickle of red running down your forearm and will need to keep practicing.) When your fingers are too tired from turning it, switch over to the wrench again and get the plug snugged up into the oil pan. What I mean by snug is about as tightly as you close the lid to a jar of peanut butter. You don’t need to force anything here, just make sure it doesn’t leak out any oil or allow mice to get inside (though that’s probably more of an issue with the peanut butter). 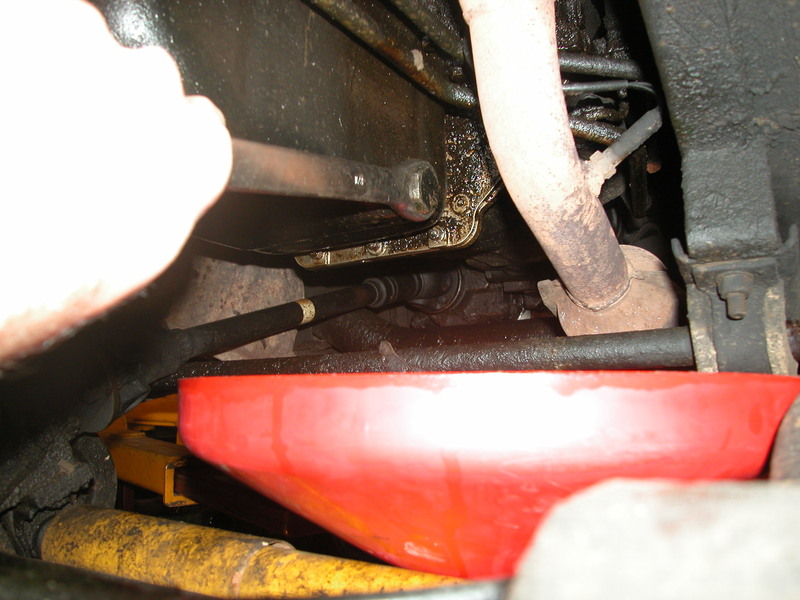 Now that you have the oil sump drained, re-plugged, and re-filled you can slide the catch basin underneath the oil filter. 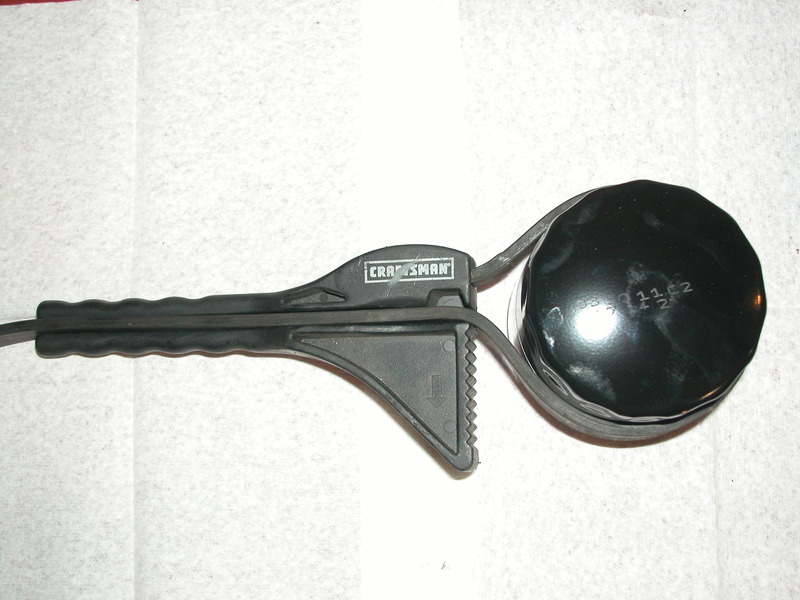 Next, grab your favorite new filter wrench from Part 1 and slide it over the filter. Give it a firm tug (counterclockwise!) 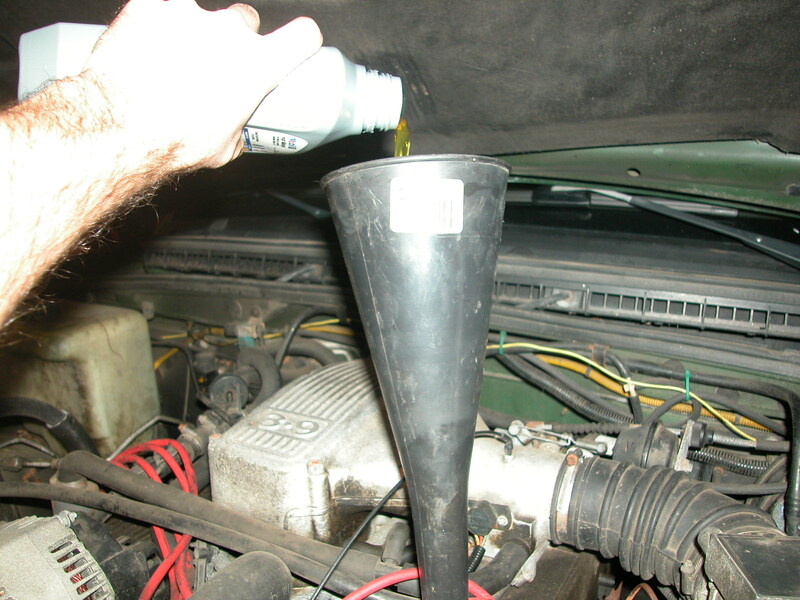 to loosen its rubber base from the metal of the engine. 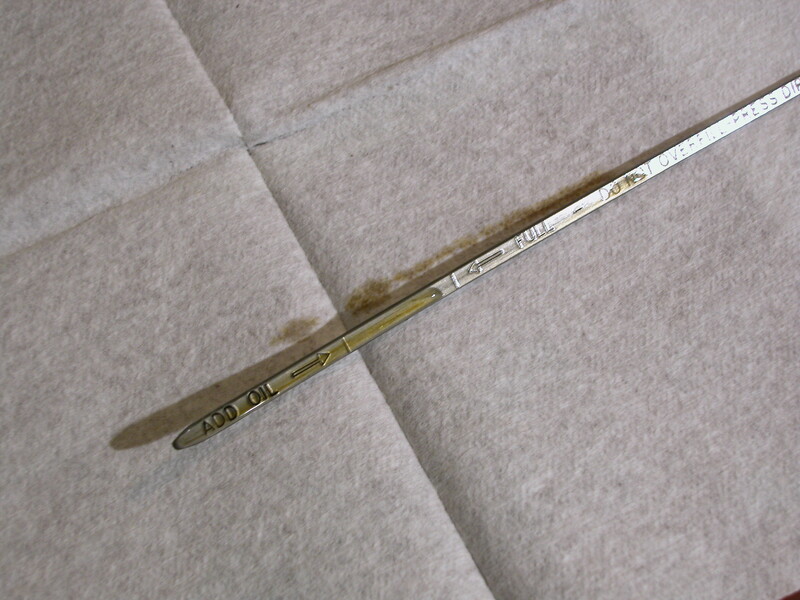 Remove the wrench from the filter and switch over to the fingertip technique again. After that initial ¼ turn or so, the filter should spin remarkably easily, which is good, since both you and it will now be covered and dripping with oil. You can remedy this mess with a fair amount of success by sliding an old bread bag over your forearm and catching some of the oil–and eventually the filter–by turning the bag inside-out as you free the filter from the its threads. If you decide against using this method, just tip the filter upside-down after loosening it to allow the oil to drain into the catch basin. This also gives the added potential for drama when the oily filter slips from your grasp and drops into the basin, splashing oil onto everything within a 3 foot radius. Now would be an excellent time to curse at a moderate volume. Once the old filter is off, you can install the new filter, but before you do, crack open a bottle of the new oil and partially fill the filter (about half-way should do it). 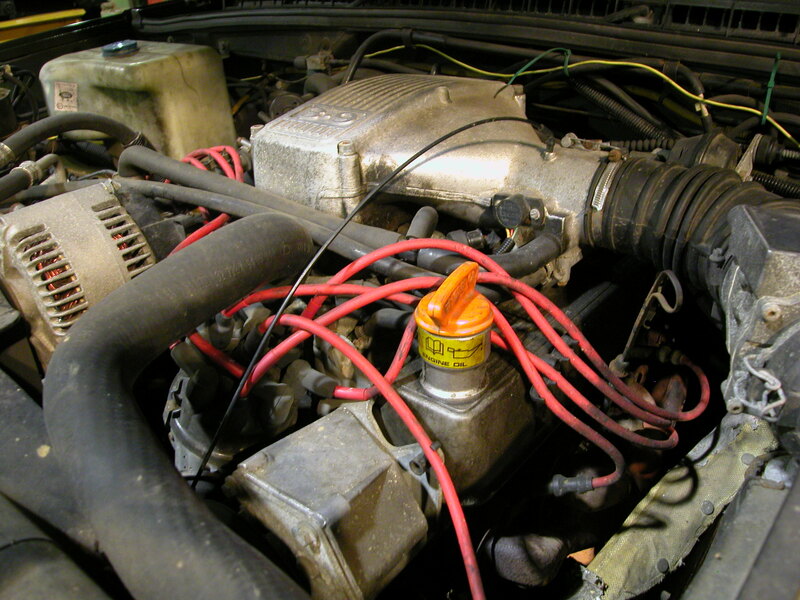 This will require less time for the engine’s oil pump to fill the new filter with oil, while cutting back on the time the engine is starved of lubrication. 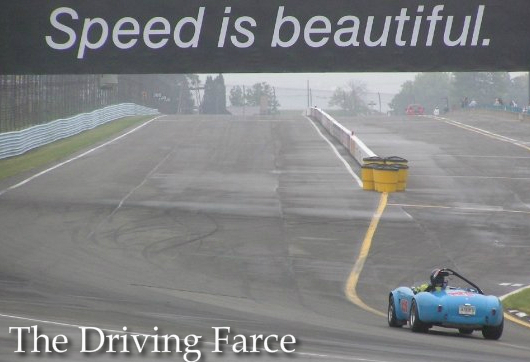 Granted, it’s only a couple of seconds’ difference, but even that can result in significantly less engine wear. At the top of the filter is a circular rubber seal. Take a dab of oil that you had spilled while filling the filter and smear it around the ring. (I was always taught to use new oil, but I see no reason why the old oil running down your forearm won’t work for this part.) This will lubricate the ring and prevent it from binding up and leaking when you tighten it against the engine. **** Spin the filter until it just makes contact with the engine. Mark the filter with a marker (or dab of oil) and grasp it with two hands to give it a final ½ to ¾ turn to snug it against the engine block. Using much more force can make future removal a real bear, so go easy. Get back into the car and crank the engine until it starts. Confirm that the oil light goes off. Since you are pumping fresh oil into all the lines again it will take longer than normal, but if the light stays on for much more than 5 seconds, I would shut the engine off and investigate. Five seconds is a long time to stare at a glowing red OIL light and you could start feeling symptoms of nausea and discomfort (akin to those experienced in a similar time span on a bad date). Wipe down the new smudges from the interior. Once the oil light is off, you should take a look underneath the car again at all the areas your grubby little paws touched. Is the oil drain plug in place? Is it leaking? If yes, shut the engine off and snug it up just a hair more. If not, keep the engine running and move your eyes to the filter to check for leaks there and re-tighten if needed. (Out of the dozens and dozens of oil changes I’ve done, I’ve only had to re-tighten one filter.) 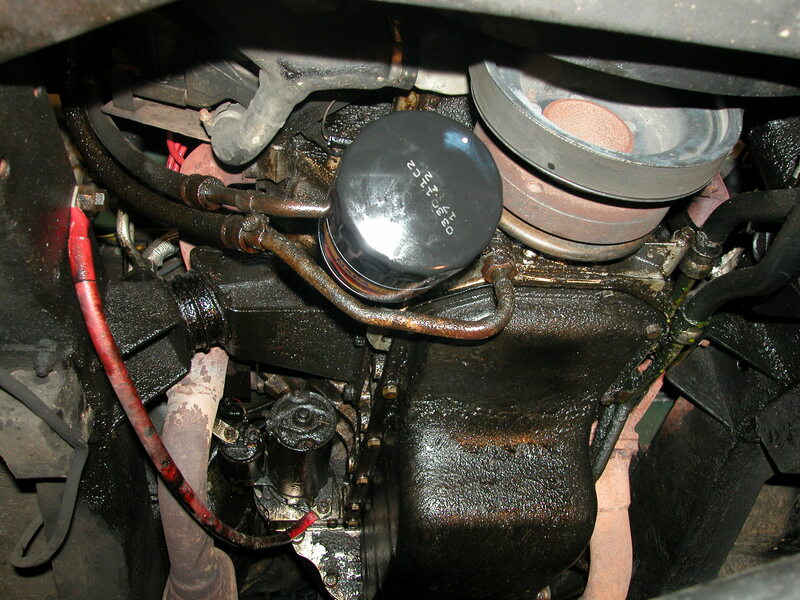 Finally, go to the top of the engine, and make sure the filler cap is fitted properly. No leaks? Good! 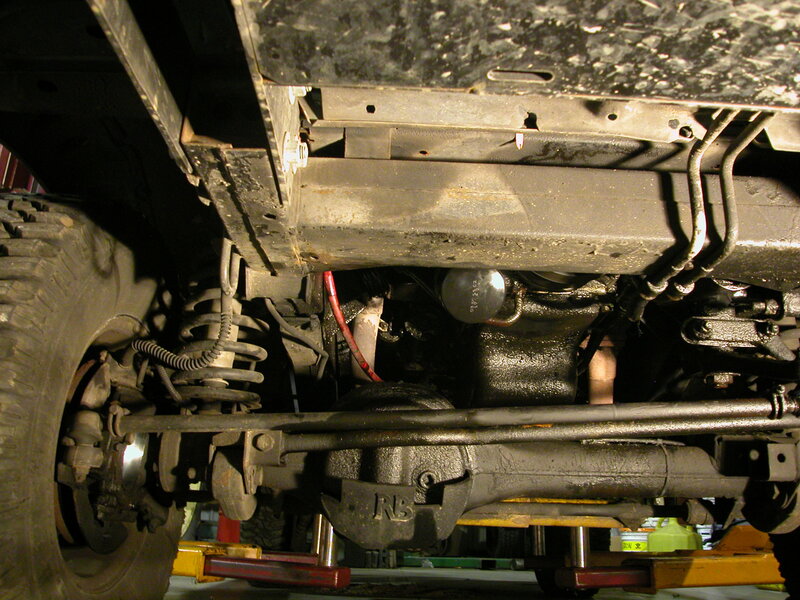 After removing the wheel chock, climb back into the car and lower it off the ramps onto level ground. Note the gallon of spilled oil all over your driveway from the catch basin that was caught by the front spoiler, since you neglected to remove it before moving the car. Now is an excellent time to curse prolifically at a bellowing volume since you are still inside the car and the neighbors can’t hear you. Once the tools are wiped down and put back into place, grab the aforementioned beverage and admire your care. Yes, you just did your first oil change. Surely the car will appreciate it. In fact, it probably has a gleam to it that wasn’t there before you started. Only you know that it’s from the oil residue left by your grubby paws, but no one else will. Enjoy this moment. You have earned it. * Note of clarification: it is difficult to drive the entire trip to the store with no oil in the engine. 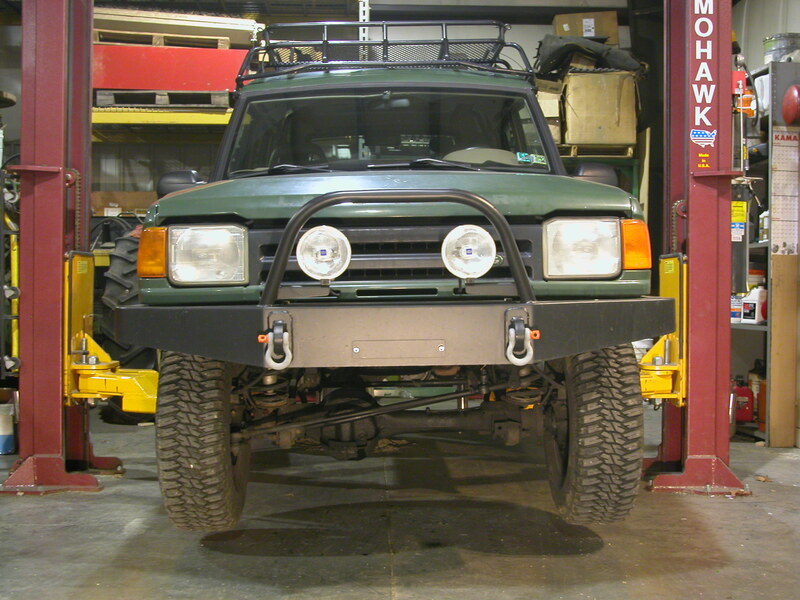 There is a very good chance that you can get part way before the engine seizes and requires replacement. ***It does not have to be paper towels; any absorbent cloth will do. A linen tablecloth will work just as well for this purpose. ****Do not skip this step! I had a cousin that neglected to do this on a Honda Accord Hatchback (remember those? ), and it ended with quarts of oil blowing past the unsealed ring in just a few seconds. Oil under pressure finds its way into everything in a hurry. Thankfully, she was aware and shut the engine down without damage, but not everyone is as intelligent as she is. Consider yourself warned.